Today marks the first anniversary of Michael Brown’s death. 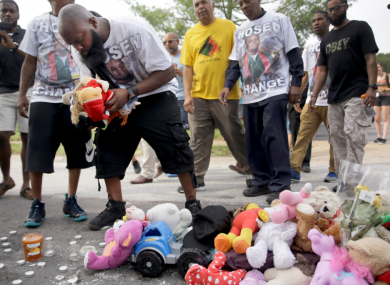 Michael Brown Sr at a memorial to his son. THE FBI HAS has been asked to help investigate the death of a Texas college football player who was fatally shot by an officer during a burglary call at a car dealership. Arlington Police Chief Will Johnson said he had spoken to the FBI’s Dallas field office after the death on Friday of Christian Taylor, a 19-year-old African-American who was unarmed when shot by a white police officer. Johnson stressed the move “in no way diminishes my confidence” in local officers to conduct the investigation. Today footage emerged of Taylor shortly before he was shot multiple times. In the video he kicks out the windshield of a car on the lot. The officers told Taylor to surrender and lie down on the ground but he refused, the chief said. They saw him trying to escape the showroom and pursued him. The incident ended with officer Brad Miller shooting his service weapon four times at Taylor and hitting him at least twice, according to Johnson. Miller has been placed on administrative leave. Police say the officer, who joined Arlington police last year and was still completing his department field training, had never before fired his weapon in the line of duty. Today marks the one-year anniversary of the death of Michael Brown, an unarmed, black 18-year-old who was fatally shot by a white police officer in Ferguson, Missouri. Brown’s death galvanized the Black Lives Matter movement and sparked national protests. Brown’s father led a march in his son’s honour today, where four-and-a-half minutes of silence were held – symbolic of the four-and-a-half hours his body was left in the street. Read: What happened to Ferguson in the year since Michael Brown was killed? Read: An unarmed white teen was shot dead by US police. Why is there no outrage? Email “Video emerges of Christian Taylor shortly before he was shot dead”. Feedback on “Video emerges of Christian Taylor shortly before he was shot dead”.